Letitia Wright in Black Panther. One of the many pleasures of Black Panther is seeing some of our finest actors come together to have the time of their lives: Michael B. Jordan, snarling through his performance as a villain who might be right; Chadwick Boseman, doing the best possible version of his stoic-badass thing; Danai Gurira, throwing her wig. But if there’s one actor you’ll come out of Black Panther raving about, it’s likely to be Letitia Wright, who steals every single one of her scenes as T’Challa’s whiz-kid younger sister, Shuri. Wright adds some much-needed lightness to the movie’s many action scenes, she’s got great chemistry with Boseman, and to top it off she gets the movie’s biggest laugh line, which I would not dare spoil for you. In the very probable scenario that Letitia Wright has just become your new favorite actress, here’s an intro guide to becoming her biggest fan. She is great! Where have I seen her before? That depends on how into British television you are. Wright moved to London from Guyana when she was a kid, and she’s said she was inspired to get into acting thanks to Akeelah and the Bee. After graduating from the Identity School of Acting, a drama school for nonwhite actors in East London, she landed roles in stuff like Top Boy, and other projects that didn’t quite make it over to the States. She eventually did the requisite episode of Doctor Who in 2015, then had a stint on Humans, and got a BAFTA nomination for her role in last year’s coming-of-age tale Urban Hymn. But if you’re reading Vulture, you probably recognize her from her episode in the most recent season of Black Mirror, “Black Museum,” otherwise known as “the one with all the references to other Black Mirror episodes.” If you’re a patron of January cinema, she also had a tiny role in the recent Liam Neeson vehicle The Commuter. What are some nice things people have said about her? Urban Hymn director Michael Caton-Jones has compared her prodigious talent to that of Leonardo DiCaprio, whom he’d worked with on This Boy’s Life. “She was just fascinating from the beginning, loose and fluid,” he told The Guardian. Black Panther director Ryan Coogler calls her “the love and the light” of the movie. Since she’s a famous millennial, I have to ask: What’s her social-media game like? Very Christian! “Everybody has their thing that they’re truthful about,” she told Vanity Fair. “My thing is just a love of God … so that’s what I’m going to do.” She credits religion for getting her through a long stint with depression a few years ago. Do you mind if I praise God? What else does she have in the pipeline? Fair enough. Do you think she’ll be in the inevitable Black Panther sequel? Still, she’s so perfect as the bratty younger sister. She didn’t have to go too Method there. “I have little brothers and sisters and they annoy me a lot,” she told Variety. One last thing — does she rap? The Black Panther lives... and so does Troublemaker! 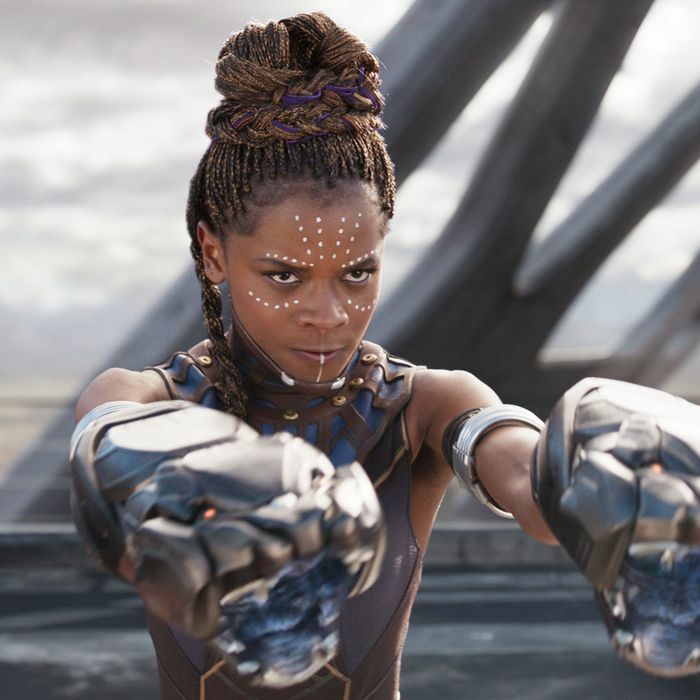 Introducing MC Underbite (@LetitiaWright), best freestyler in Wakanda. All cred to my girl @RobynHoodmusic for the original inspiration and my bars.